We offer individual solutions for everything to do with energy, building, and control technologies. Tailored perfectly to your needs. Future-proof, commercially viable, and ecologically sustainable. All in one place—from advising and planning through to realisation, operation, and ongoing support. Take advantage of our many years of experience. We are your partner for all questions relating to building systems technology, security, electrical installations, and network technology. We are your professional experts on all matters in the field of intelligent building automation. Start thinking ahead today. Only sophisticated and perfectly designed electrical installation ensures that both your current as well as future needs are taken care of. For this reason, we develop individual solutions together with our customers. We are already connecting today to tomorrow—with intelligent electrical installation that can be expanded and adapted to changing requirements at any time. Our systems grow with your success. For comfort without compromises. Let us advise you and discover what is possible. Today and in the future. 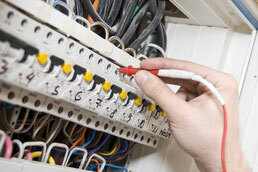 We offer all the services you need for electrical building installations. That means: we do the planning, installation, and maintenance. 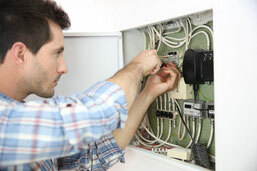 We take care of the wiring, fuses, and lighting. And we do this in all buildings—from office complexes to manufacturing facilities and, of course, residential buildings. We always have an eye on coming developments in the sector: we combine classic, conventional electrical installations with ultra-modern, pioneering technologies. Not just in new buildings either, as we do older ones too. We update or renovate all electrical installations and, even in older properties, we update all communication systems in line with the latest technologies. If you are building from scratch, we are happy to help you design and put in place your entire electrical installation. We pay close attention to your individual desires and consult closely with your architect and construction manager. 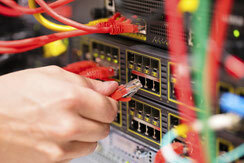 We are your specialists for the entire field of data and network technology, making your processes smooth and secure. Only high-performing, reliable network infrastructure can provide the basis for powerful IT systems. We pay just as much attention to providing an efficient energy supply for your servers as we do to fast response times and optimal maintenance. As your network partner, we look for close, personal dialogue and robust cooperation with everyone involved. Only this way can we guarantee the perfect, reliable network architecture tailored to your needs. Now that’s smart: our smart home systems transform your house or apartment into an intelligent home. Whether lighting, curtains, heating, or the intercom—a tap on the control panel or your smartphone is enough to easily manage nearly all the devices and systems in your house. And you can even do that when you're on the go. This means you can control your house’s lighting when away on holiday, or have the heating turn on even when you're still on the way home from work. Another advantage: compared to conventional electrical installations, the additional costs are minimal. Open your home up to the future. 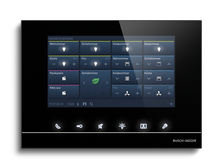 The smart specialists at ELkomp are happy to advise you on the many diverse options for smart home systems. The same applies here: we are a one-stop shop. We offer you a complete package for testing your electrical systems for legal compliance. This means you can rest assured that they are safe in operation. A compliance check gives you peace of mind, with the knowledge that your electrical installations and devices satisfy all safety requirements. We check the serviceability and functionality of your electrical systems, that they are working safely and as they should, and show you any unused energy saving opportunities. Whether private, industrial, or in the agricultural sector: the need for security is growing and thus our demands of technology too. ELkomp Electrical Technology doesn't just take care of the installation and activation of your security systems, as our range of services extends to designing complete security concepts. After successful activation and giving you lots of advice on how to use your new system, our technicians are available round the clock to make sure it functions reliably. We design our intrusion detection, alarm, and CCTV systems based completely on your individual demands. Is it a private or a commercial building that needs protection? Do you want complete monitoring or only partial? Should the alarm be sounded using a siren in the building or through a remote alarm? 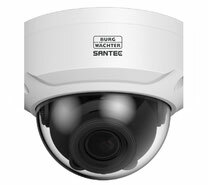 Does it make sense to integrate video surveillance into existing systems? Would you prefer the front door access control to be based on chip technology or fingerprint? We will settle all these questions and many more before we start anything. This way we will find the best, and most of all, most secure solution for you together. In der Hansestadt Hamburg am südlichen Rand begrüßen wir Sie gern in unseren Räumlichkeiten. Welcome to our rooms in the south of Hamburg.